My husband loves watching Gold Rush. The miners start with a small pan to test the ground. Eventually they end up moving a lot of dirt through these machines that shake the dirt to separate it from the gold. A lot of water rushes through the machines and in the end the stuff that comes from the machine is refined by fire. The finished product is what the miners desire, but it has to go through the process. As I read this scripture, I thought about how a God takes us through a similar process. In times of trouble God is there for us. He takes all that we are, and all that we have done, all that has been done to us, and all that has been said about us and dumps it into the process He takes us through. In the shaking, we feel oppressed, but God is with us. He is shaking from us all that keeps us bound. Everything that keeps oppressing us, God wants to shake off our life. 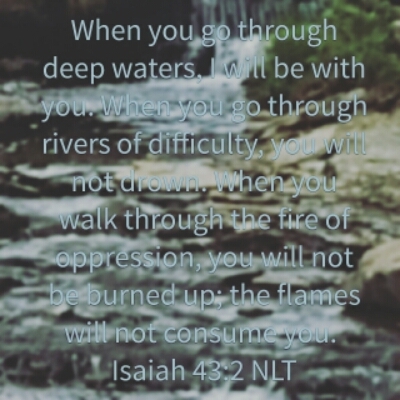 He will not allow the fire to consume us. If we hold to Him, what the enemy means to destroy us, God will use to purify and restore us. Precious metals and jewels are not destroyed in pressure, they are formed and refined. We are God’s treasure. This entry was posted in Faith and tagged Lessons, Scripture, trust. Bookmark the permalink.